Jorge Antonio Gómez Díaz obtained his “Licenciatura” degree in 2010, graduating as Biologist in the Universidad Veracruzana (UV). He made a Specialization in Statistical methods in the UV from 2011 to 2012. 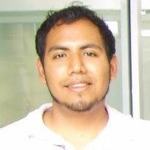 He worked as herbarium assistant at the Centro de Investigaciones Tropicales (CITRO) of the UV from 2010 to 2012. Since October 2012, he is coursing his PhD. in the Department of Landscape Ecology (LÖ) at the University of Göttingen, Germany. His areas of performance are botany, plant ecology and effects of human disturbance on vegetation. He is coauthor of two book chapters. Currently, he is collaborating on a research project, which is aimed to quantify the impact of human disturbance in forests in mountainous areas. Feeding the Gods: What Plants Were the Maya Growing in the City Center of La Milpa, Belize?